Cisdem AppCrypt for Mac Discount Coupon Code - Special 40% OFF!! 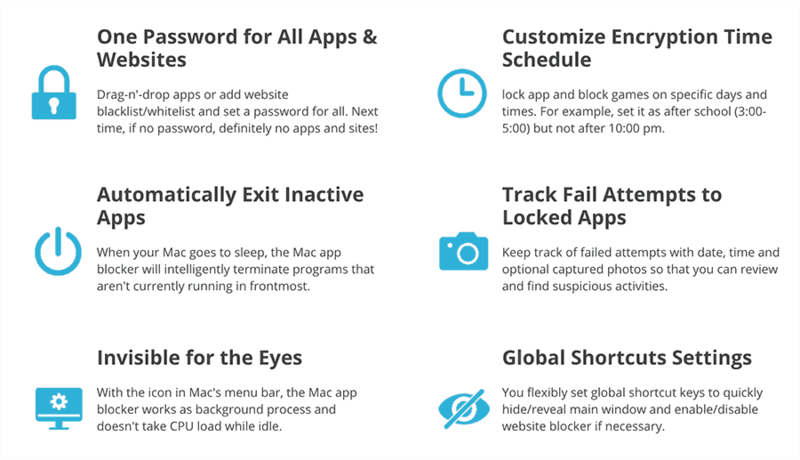 Your Mac is a powerful tool that you can rely on to get your stuff done. But often, you might have to share your Mac with other people. During those times, it’s always a good thing to put certain restrictions on the stuff they’re allowed to access. You wouldn’t want them to be snooping around looking for sensitive information or playing with system settings that you don’t prefer to change. For putting such restrictions on your Mac, Cisdem AppCrypt is a great utility that enables you to lock selected apps with a password. After setting it up, Cisdem AppCrypt runs on the Mac menu bar, and whenever you try to open an app which is locked by Cisdem AppCrypt, it asks for the predefined password. AppCrypt also locks its own app settings, so anyone trying to make changes to the app lock preferences will also have to know the AppCrypt password. AppCrypt can also help you focus on completing a specific task, by offering a scheduler to lock access to certain apps for a specified duration. It also has a WebLock utility, which can block access to specific websites. Thus, AppCrypt can be used as a multipurpose tool — an app locker to protect your sensitive data and settings, a focus tool that restricts distractions, and a parental control utility to ensure that your children aren’t accessing apps and websites that they aren’t supposed to. You can learn more about the tool in this article. Cisdem AppCrypt is available as a free trial for three days, after which you need a license to continue using. A single license for Cisdem AppCrypt costs $29.99, a double license costs $44.99 while a license for up to 5 Macs for $82.99. But for 7labs users, we are bringing a special discount of 25% on all three licenses. That means a $7.50 discount on the single license, an $11.25 discount on the double license and a $20.75 discount on the 5-Mac license. All you need to do is to click on the appropriate license link below, and ensure that the following coupon code is applied at checkout to avail the offer.